Like humans, cities are mortal. They are born, they thrive, and they eventually die. 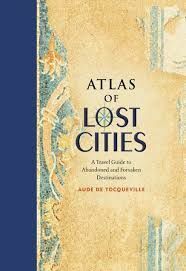 In Atlas of Lost Cities, Aude de Tocqueville tells the compelling narrative of the rise and fall of such notable places as Pompeii, Teotihuacán, and Angkor. Beautiful, original artwork shows the location of these forgotten cities and depicts how they looked when they thrived once upon a time.